Break me off a piece of this ice cream cone! If you’re a fan of the chocolaty wafer candy bar, get ready to take things up a level with KitKat Drumsticks. Thanks to eagle-eyed Instagramers like @snackgator, we know that this sweet treat has made its way to the frozen food section of Kroger. 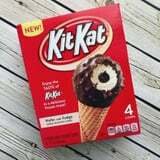 This frozen candy bar mashup takes the classic Drumstick cone, chocolate shell, and fudge center and pairs it with KitKat pieces. These Drumsticks have only been spotted at Kroger so far, but fingers crossed they make their way to other retailers soon. Even in the middle of Winter, I’m ready to buy these in bulk!